Microsoft Natural keyboard platform with sliding mouse platform for left or right handed use. 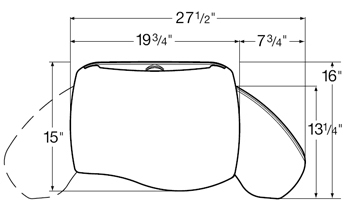 Unique Mouse Forward Design: Mouse slide creates Mouse-Forward position for improved ergonomic comfort. 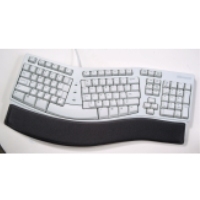 Designed for Microsoft Natural Keyboards: Shaped to follow the front contours of Microsoft Natural and Elite keyboards. Thoughtful Features: All Ultra-Thin platforms have the Optimizer, an integrated keyboard cord management feature, along with a built-in document holder and mouse cord retainer. Durable Platform: Our ¼" Ultra-Thin phenolic minimizes the distance between the forearm and thigh, providing a greater range of ergonomic fit. Patented design follows contour of Microsoft Natural and Natural Elite keyboards. 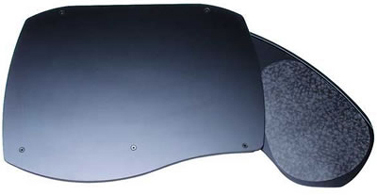 Slide-out mouse platform provides MouseForward design. Designed specially for Microsoft Natural Keyboard. 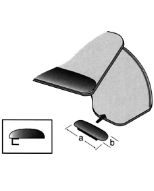 Fits curved corner over 12", diagonal corner over 12" and 90 degree corner with adapter. 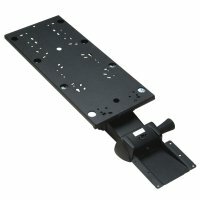 Question: What is the arm, mouse support, swivel plate, spacer, track length, and positive tilt under the Options? Answer: The Arm is the mechanism that enables you to adjust the keyboard. You attach the keyboard tray to the arm and track to make sure that the keyboard platform can adjust to the level that you want and also retracts under the worksurface. 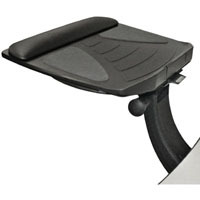 The clip on mouse support adds mouse area palm support to the platform and gets attached to the mouse platform next to the keyboard tray. 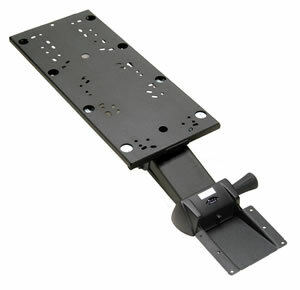 The Swivel plate installs between the arm and the keyboard tray to provide 45 degree pivot to the keyboard tray. Spacer is needed if your desk has a lip and we need to flush the bottom of the desk to be able to install the track. Track length is to determine how much clearance you have underneath your desk. You need to ensure that there are no obstacles in the area that you need to install the track. The preferred track length is 22”, as it enables you to retract the keyboard tray fully underneath your desk. Positive tilt Lock is a pin that is inserted to prevent the tilt from going positive as it is not ergonomically sound and it would harm the wrist. 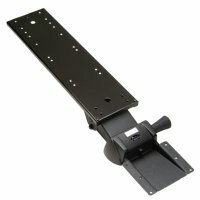 I purchased and installed one of these keyboard shelves for my wife's computer desk several years ago and she has been very happy with it. So when my own keyboard shelf came apart recently (from a different manufacturer), I immediately ordered this keyboard tray from ErgoDirect. It is very well-constructed and easy to install, and adjusts easily for various needs. I definitely recommend it.